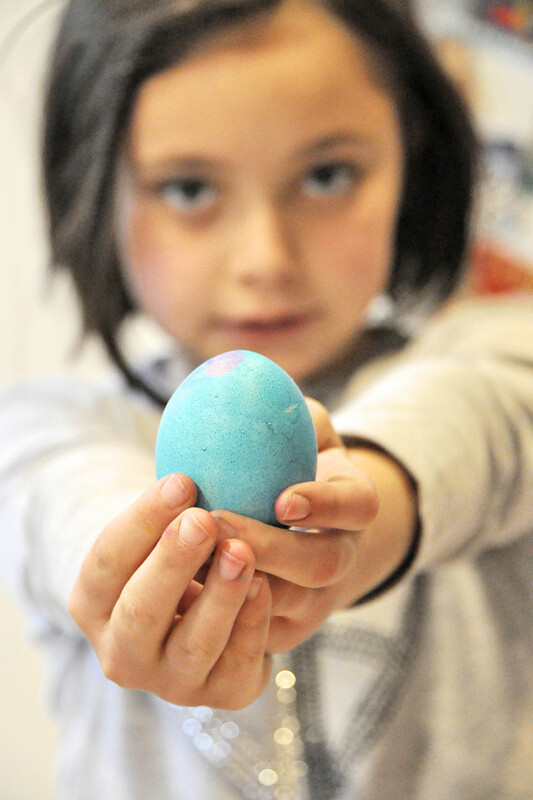 Like millions across the country, we dyed eggs this past weekend. And took pictures of the whole process. I have about 5 years worth of egg-dying photos now. (I see a big scrapbook collage with lots of 2×2 photos in my future). And each year I try to capture the one with the egg in focus and her face in the background smiling as she shows off her masterpieces one by one. Well, I got the egg in focus, and she’s nicely out of focus in the background. But no smile this year! I set my camera to “A” (aperture priority) and dialed in the widest aperture opening I could (f/5.7 at 97mm) so that the in front of and behind my subject (the egg) would be out of focus. I had my ISO turned all the way up to 3200 so that I would not have to use a flash. I like the result. And the egg went on to be further decorated and then promptly turned into a deviled egg!